The first Sikh Attorney General, New Jersey's Gurbir Grewal spoke at Pascack Valley's Unity in the Valley event on Tuesday, March 19. Grewal chatted with Smoke Signal Editor in Chief Madison Gallo prior to the event. MADISON GALLO, editor-in-chief of The Smoke Signal: We know that you’ll be presenting tonight, so we wanted to ask you some questions about things that we didn’t think you would include when you were presenting. Can you talk a little bit about where you grew up and where you went to high school and college? GURBIR GREWAL, Attorney General of New Jersey: I was born in Jersey City, but I spent most of my childhood, early childhood in actually in Bergen County. I grew up in Westwood and Washington Township, not too far from here. And then, around fifth grade, I left to move to Essex County, and then I went to high school out in Essex County. And then after that – I don’t know, are you a senior? 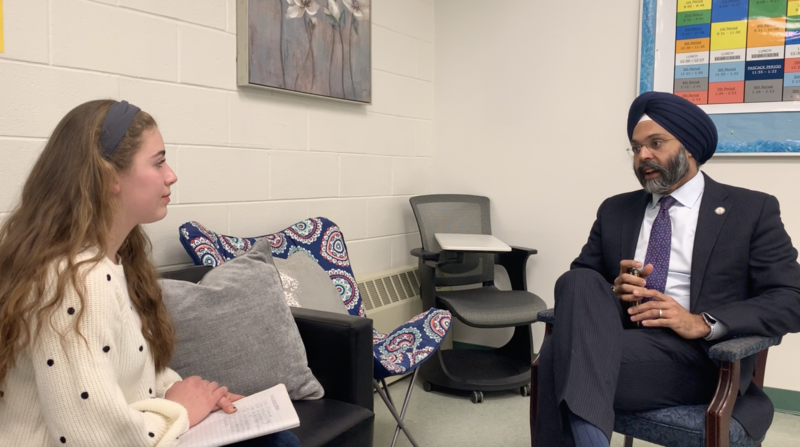 GREWAL: So when I was a senior, I had this thought that I was going to be a writer and that I was going to go to a small liberal arts college in Maine and it was going to be the best thing for me. And I ended up going to Bates College in Maine for a year, and it was just way too cold and I didn’t want to be a writer, and so I transferred to Georgetown and I got a degree in foreign service from Georgetown, and then I eventually gravitated towards law school and went to William and Mary for law school in Williamsburg, Virginia. And then [I] practiced in D.C. for a long time, and then started my public service journey in 2004. GALLO: Growing up, what was your family life like and your experiences at school? GREWAL: Yeah, so I mean I break it into two parts: my Bergen County part of my childhood – I’m an only-child – so when I was growing up in Bergen County, there weren’t many kids who looked like me, who had the same background as I did, whose families came from India. But when I grew up in Bergen County, I went to school with the same group of kids from the time I was in kindergarten till the time when I was in fourth grade. So I was always just sort of part of the group, so it was a very normal childhood. And then when I moved, it was sort of like a wake up call, that I was around folks who didn’t know me at all and not only did I not look like them, they had never known me, so it was a little bit rough at first. And, relevant to some of topics we’ll talk about tonight, [I] dealt with a lot of bullying, dealt with a lot of just misunderstanding about my background, who I was, and just teasing and, you know, things that no kid should have to go through. And I think that experience sort of informs how I deal with people and some of the things I do to try to call out the type of behavior that bothers me and how I approached things as a prosecutor when I was here in Bergen, and some of the initiatives that I’m pursuing as Attorney General now. GALLO: What have been the highlights in your career as Attorney General or as a prosecutor? GREWAL: So I think, as AG, since I was sworn-in in January of 2018, I think of the high points for me, you know I inherited an incredible office, my predecessor [Christopher Porrino] was great, I am responsible for 14 divisions and 8,000 people across those 14 divisions. One of the things we never really did was do federal facing work that Attorneys General are doing now, you know trying to hold the [Trump] Administration accountable when it violates the law, when it violates our Constitutional norms, our sense of decency, and so we had to really build out that capacity. And I think the highlight for me last year was when we, as New Jersey, filed a motion to intervene in the DACA [Deferred Action for Childhood Arrivals] case in Texas, when the federal government was supposed to defend that case. The state of Texas had sued to join the DACA program, and to really uproot the lives of our Dreamers, and so we intervened in that case to represent the interests of the 17,000 Dreamers in New Jersey and the 800,000 plus Dreamers in this country, and we went down to Texas, we fought that case, and we defeated their first attempt to join the DACA program, and I think because of that, 17,000 kids – now adults – have a little bit of a chance to live a normal life for the time being. And I think that really drove home to me the power we had as an Attorney General’s office to affect lives. But there’s so much, you know, like between our environmental work, between our consumer protection work, our civil rights work, just the impact we have on lives is what has been the highlight for me. GALLO: And has anything unexpected happened while you were AG or prosecutor? GREWAL: So, I think everyday is unexpected, there’s always a different surprise. I don’t think there’s one particular thing that jumps out. I think what’s been unexpected is just, when you come into a big department like the one I inherited, you’re always cautious at first when you’re taking it in a different direction. So you don’t really expect people to buy in right away to your vision of your core priorities, and what really surprised me was sort of unexpected is that people were just one-hundred percent on-board [with] the direction we wanted to take the AG’s office. We came in with four core priorities: one was fighting the opioid crisis, two was addressing violence in the state – gang violence, gun violence, third was improving police-community relations, and fourth was using our litigation tools to stand up for the rights of New Jerseyans, whether it comes, like I said before, to the environment, civil rights, all sorts of areas that impact lives. People just bought in, and that was a little bit surprising at first, but it’s encouraging now. GALLO: How did everything come about with you being a speaker at our school? GREWAL: Your Superintendent [Erik Gundersen] reached out to me, and then Tammy Molinelli [President of the Pascack Valley Regional High School District Board of Education], reached out to me, and I couldn’t say no to either of them, but it’s not even them reaching out… listen, when I was a county prosecutor here in Bergen, we dealt with – and I was prosecutor from 2016 to 2018 until I became Attorney General – we dealt with bias incidents and anti-semitism in schools. We saw the rise on a national level, but what was most troubling to me as a prosecutor and as a parent, is that it was creeping into our schools. When you have juveniles engaging in this type of conduct, I know where it could potentially lead, as a prosecutor I’ve seen the worst of this, and so I interceded early in a number of other schools. And when I heard that it was happening again, it really troubled me and I wanted to be here to be a part of the solution. GALLO: Thank you so much for that. GALLO: Is there any advise that you’d give to the youth of today – I guess you were kind of leading into that with your last answer. GERWAL: I think that it’s going to be the youth of today that fix this. There [is] so much wrong with us a society right now, whether it comes to gun violence – the youth are leading the charge there. What we saw after Parkland was the power of the youth to really move the conversation on guns in this country. For decades, people have been trying to really implement reasonable gun safety regulations, but it was the voice of the youth that really pushed legislatures to come up with real solutions. And I think, for any problem that we deal with, it’s going to be your voices that are going to help us find the solutions, because my generation and the generation ahead of us are sort of screwing this up right now. And we need that sort of check, that the youth that we are seeing: organizing around the walkout around environmental issues, really prompting meaningful conversations. And that’s what, in all the negativity, is the most encouraging thing, is how the youth are coalescing and becoming more socially involved and socially-conscious. GALLO: Thank you so much for your time.